Back in 1936, whilst on tour with Geraldo's Gaucho Orchestra, a group of us made a habit of attending tea dances at ballrooms in the various cities we visited. During a week when we were playing twice nightly at the Glasgow Empire- a fine theatre now unhappily defunct- we went along to Green's Playhouse Ballroom, where Duncan Whyte's Quintet were playing. Duncan was at that time the only member of the group known to me, as he had previously worked in London with a number of well- known bands and we had been fellow- members of one of Syd Lipton's orchestras at Grosvenor House. But on that rather chilly October afternoon the player who really made us sit up and take notice was the pianist of the band. Not so much for his piano playing, which was competent enough, but for his trombone playing in certain numbers when the lady vocalist took over at the piano. If you have not already guessed it, the trombone player was the one and only "Chis". Very soon afterwards George Chisholm came to London, following by a few months his friend Tommy McQuater, who had already well and truly made his mark among us Sassenachs. The records of these two grand musicians are too well- known to need any exposition from me. 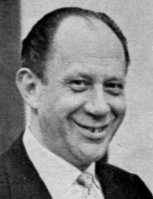 There are, nevertheless; incidents worth recounting of an amusing nature, two of which are concerned with the late Bert Ambrose, who did much to maintain musical standards in the fields of jazz and popular music- mainly by recognising that good talent was worthy of good pay. It seems that when Tommy ultimately joined the Ambrose Orchestra and had taken off in several solos during his first rehearsal with it, Ambrose leaned over to Ivor Mairants and asked : "Is that good, then? ", and upon being assured that it was, then turned his attention to getting home to bed— something that he always did after rehearsal! Apparently, a similar incident, but applying to George, occurred later when there was a change in the trombone section. Having become used to the sounds produced by three other fine trombonists, Ambrose could not easily assimilate the new Chisholm sound. In due course George and Tommy, along with Jock Cummings and other members of the second or perhaps third Scottish invasion of London, joined the RAF and, ultimately, the famous Squadronaires were formed, which reminds me of another incident which was for me an unforgettably thrilling musical experience. Readers will remember the old "Jazz Jamboree" concerts, run annually by the Musicians' Social and Benevolent Council to raise funds for the Musicians' Union's Benevolent Fund for many years between 1938 and 1964. It was at one of these, in either 1942 or 1943, at the old Stoll Theatre, that the. incident occurred. The Squadronaires were closing the first half of the show with "I've Found A New Baby", the programme was running late, there being many bands to fit in, when George stood up to take his solo, which normally was a one chorus effort. On this occasion, however, he appeared to be completely carried away and was well into his fourth consecutive chorus, each a different and individual gem, with the audience literally on their feet and cheering, when the stage manager decided to drop the tabs. No organised fan club effort this but an honest- to- goodness spontaneous audience response to an equally honest- to- goodness performance. I have been moved to write about George Chisholm as the result of seeing and hearing him in the BBC Omnibus British jazz programme as an addition to the Alex Welsh Band, which has maintained a wonderfully high standard of performance over the years, and which, as George put it in a preceding interview, plays "a happy vibrant style of music. . an endless music that has been the mainstay of jazz". The band's various soloists made a masterful contribution to what was an obviously important programme, and George's delightful extempore and unaccompanied duet with Roy Williams, the band's regular trombonist, was also a superb example of two front- line players knowing exactly where the beat was without the aid of a rhythm section. Other jazz contributions to the same programme were by Bill Le Sage's Bebop Preservation Society, very authentic and efficient, a reconstructed Humphrey Lyttelton original band, George Melly, talking and singing the blues and brief interludes by Chris Barber and Acker Bilk. There were also performances by the groups of Alexis Korner and Ian Carr, the former being of a down- to- earth gutsy blues character and the latter containing many passages the relationship with jazz of which was, to say the least, highly dubious. The programme, being described, as it was, as "British Jazz", was perhaps disappointing inasmuch that with the exception of the contribution of the group known as "Iskra 1903", to which I shall refer later, and Ian Carr's contribution, which came nearer to being Afro- Cuban than anything, all the jazz was clearly American in origin- even though in most cases extremely well played by British musicians. I should have thought that in such a programme the inclusion of original items played by the Ray Premru- Bobby Lamb and John Dankworth ensembles would have come much nearer the description "British". Early in the programme, in an interview, George Chisholm described how he had joined in a performance by a so- called avant garde group, and told us how having deliberately fooled around in his "solo", playing any kind of rubbish that seemed to be appropriate, he had received the plaudits of the other performers and audience. George's description, of course, was an entertainment in itself, but its effectiveness was of no help to the Iskra 1903 group that was presented later in the programme! When I saw the title of this group I was intrigued, for "Iskra", of course, is the Russian for "Spark" and was the name of the progressive newspaper founded by Lenin in 1900. I fail to see how the efforts of Iskra 1903 can be regarded as progressive in any sense— even if they can be regarded as musical at all! Charles Fox, in introducing the group, said : "It's ironic that many British jazz musicians are more honoured abroad than in their homeland. In a few days' time Iskra 1903 are off to Berlin to record for a major German company. Nobody would call Iskra 1903 typical of modern British jazz. They throw overboard all the rules, all the familiar landmarks but they do represent a new, very European, branch of the jazz avant garde". Whilst I can agree with him that nobody would call Iskra 1903 typical of modern British jazz, I completely disagree that they represent European jazz avant garde. Avant garde perhaps, but jezz never! Indeed, I find it impossible to accept as music of any kind a performance to which I was listening for a full thirty seconds before I realised, with a sense of shock if not horror, that the musicians were not still tuning up! It is obvious that the group throw overboard "all the rules" and "all the familiar landmarks". As a member of the group put it: "We don't use the conventional reference points in music, that is of time, rhythm and scale structure and things like that. We have to sort of rely on the basic structure of music which is, to me, sort of noise and sound". The result is utter chaos— equivalent to that which would exist on the M1 or any other main road if some giant hand removed all the road signs overnight! Another member of the group said that it was a question of reacting to all the sounds around you, and continued: ". . . so unless you took the tape apart note by note and wanted to analyse it, which would be futile, anyway. . . no, I don't think you can play wrong notes but you can play wrong music". A third member said: "The music's practical; it either works out or not at the time you play it, and that's the end of it". The sounds' produced were indescribable, their only connection with music being that they were made with musical instruments, and I certainly agreed with the member of the group who said : "I think as far as jazz fans are concerned they are not interested in this music because it doesn't have certain basic elements, and straight musicians are not interested because it doesn't have enough to do with the academic side". Neither the BBC or anyone else does a service to jazz when it includes such performances in jazz music programmes. Why not have another heading for them, like: "BBC Omnibus: Noise In Britain"? There are all manner of variations upon such a theme- the sounds to be heard on a building site, or in a restaurant when the tables are being laid. But perhaps we already have enough noise!